Paperback, 7 x 9 in. / 224 pgs / 32 color. What role should a city's historic architecture play in its future? In areas facing demographic shifts towards lower populations and, in a vicious cycle, economic slowdown--in the European and American heartlands--the question is crucial. And any answer requires innovative methods of preservation for monuments and historic buildings, beyond the current standards. Ideas for the reevaluation of structures at hand, for subsequent discourse, and for preservation itself are illustrated here with cases from the European cities of Quedlinburg, Halle-Neustadt, Le Havre, Ljubljana and Novi Beograd. 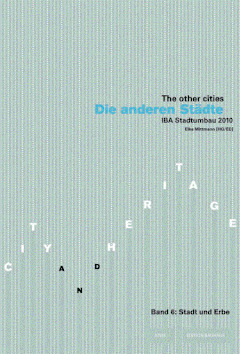 The organization behind The Other Cities series, International Building Exhibition (IBA) Urban Redevelopment 2010, is an innovative project established by Saxony-Anhalt in the face of urban attrition there. 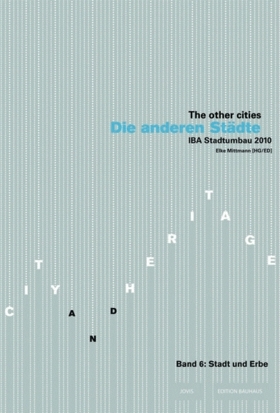 Town and Heritage is the sixth volume of their Other Cities series. FORMAT: Paperback, 7 x 9 in. / 224 pgs / 32 color.